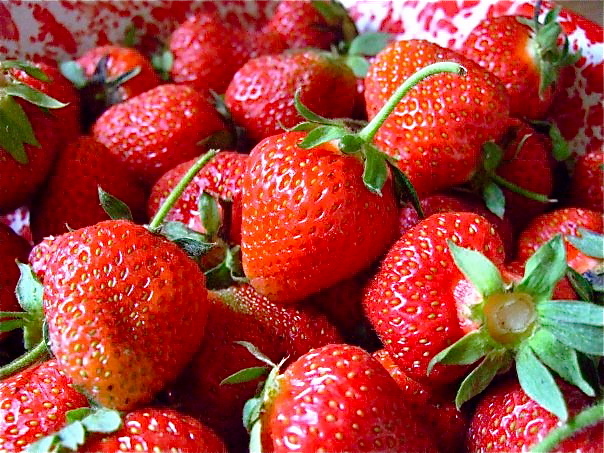 Fresh Strawberries, truly a taste of summer. Imagine yourself on a bright and sunny yet breezy Saturday morning, sitting on your balcony, deck or patio relaxing and enjoying a stack of freshly made, hot off the griddle pancakes drizzled with your very own homemade berry syrup made fresh from local organic strawberries and the Saturday morning comic section. What says summer more than Strawberries and good old-fashioned home cooking? Enjoy these recipes. If you have always made pancakes from a box, please give this a try. It’s actually so easy to make them from scratch, it will amaze you. Place the strawberries in a food processor and process them into a chunky purée. Transfer the purée to a small saucepan over low heat and heat just until warm. Stir in the lemon juice and maple syrup. In a large bowl, whisk together the flour, baking powder, baking soda, and salt. In a medium bowl, beat together the eggs, milk, honey, and vanilla. Coat a large non-stick griddle or skillet with cooking spray and preheat over medium-low heat. Stir the wet ingredients into the dry ingredients, mixing only enough to combine them. The batter will be a bit lumpy. Use a 1/4-cup measure to ladle the batter onto the hot griddle or skillet. Flip the pancakes when they are golden brown on the bottom and bubbles are forming on top, about 1-1/2 minutes. Cook the other side until golden brown, about another 1-1/2 minutes. Keep the pancakes warm in a 200°F oven as you finish cooking the remaining ones. Ladle about 1/3 cup of the strawberry sauce onto each plate, place the pancakes on top, sprinkle with confectioners’ sugar, if using, and serve. Or pour syrup over a stack of pancakes. May I suggest you make a double batch? I think you won’t be disappointed. This entry was posted in Uncategorized and tagged Bread, Cake, Jam, maple syrup, Strawberries, Tasty Treats. Bookmark the permalink. Hello Lady Locavore… I just received an email from a local food site, and your ‘blog recipe’ link was attached. I printed the recipe off for ‘strawberry syrup’. My husband makes ‘his famous’ pancakes all the time…now he can also boast about the fab syrup he’ll have to pour over them!